Come have some fun with us! 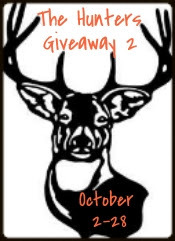 Grab a prize that is related to hunting, camping, fishing and hop along or just let others hop to you! You must have at least a $20 prize/package together to be given away during the event. It can be anything that is hunting related. Participation is completely FREE! All I ask is you write a post encouraging other bloggers to join in the fun! If you do not wish to write a post then I ask that you pay a $5 post waiver fee. Payments may be sent to andersonsangels2010@gmail.com via Paypal. Please put the link to your blog post in the form when you sign up or pay the fee before filling out the form. Which ever blog gets the most blogs to sign up and participate in this event will receive $20 Paypal!! Anyone Worldwide is able to Participate! !